First, caterers need to be good at understanding people’s needs and wants. They have to know how to “cater” to different sized crowds with different tastes. In that respect, they really have to understand the sociology of groups. How do groups operate? For instance, if you’ve got a group of people over 55 who want to eat dinner, do you think they’d like to eat at 5pm or 9pm? Most likely, they want to eat “early.” If you have a bunch of black folks gathered, might they like okra, greens and mac and cheese? Probably. What about kids? They’d prefer chicken fingers and french fries to any foods with hard-to-pronounce names! Caterers need to have an idea of who they’re serving and what those people like (and dislike). Next, caterers often become de facto event organizers. You wouldn’t believe how many people come up with the idea to throw a party or event but then no one is actually in charge of how the flow of events and flow of people should happen the day of the event. It’s like a rudderless ship! So, guess what? 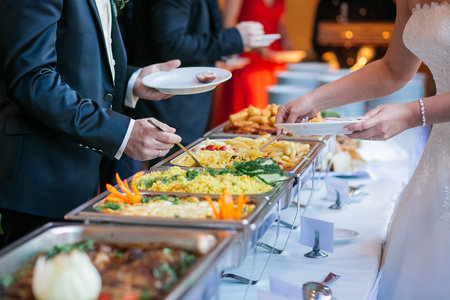 The caterer steps in and takes control– he or she decides when people will eat, and which table gets called first to come up to the buffet, or which table gets served first, etc. Also, caterers need to be business-minded. Just because they’re great at preparing a certain dish that people love doesn’t mean they can ignore the money side of things. A budget has to be written down and applied. Things have to be ordered “in time.” Bills and invoices have to be sent. Money has to be collected and deposited in the bank. Salaries have to be paid. Caterers are typically small business owners who have all of the responsibilities that owning one’s own business entails. Finally, caterers have to be able to handle stress because their job requires long and difficult hours. There’s a lot of standing on one’s feet, bending over, stirring things, moving pots and pans, and dealing with problems at any time. For instance, sometimes things burn in the kitchen and have to be remade. Just like with any job, things can and do go wrong. It’s stressful. But a good caterer knows how to get around/over obstacles and overcome problems. They can think fast on their feet, improvise and make the best of their situation. If you’re looking for a reliable catering service in the Bensalem, PA area, then contact R&R Caterers today.